U - ZC - S brush type gravity impurity self-cleaning filter series is used in the fluid which contains more gravity impurities in filtering medium. 25 ~ 3500 micron strainer with 2 "- 36" diameter can be equipped based on the operation requirements. U-ZC-S brush type self cleaning filter reaches the international frist-class level in the product design standard, running performance and quality, which meets the most demaning requirement of rnd users. 1. When the pressure differential switch detected that the pressure difference between the inside and outside of the filter mesh reaches the preset value (0.5 bar). 2. The drain valve is opened to the air. 3. The motor drives the steel brush in the mesh to rotate. 4. The membrane drain valve is closed. 1. Continuously water supply: the cleaning process needs nearly 5% of filter water, and the washing time is 15-30 seconds, the water supply is uninterrupted during operation. 2. 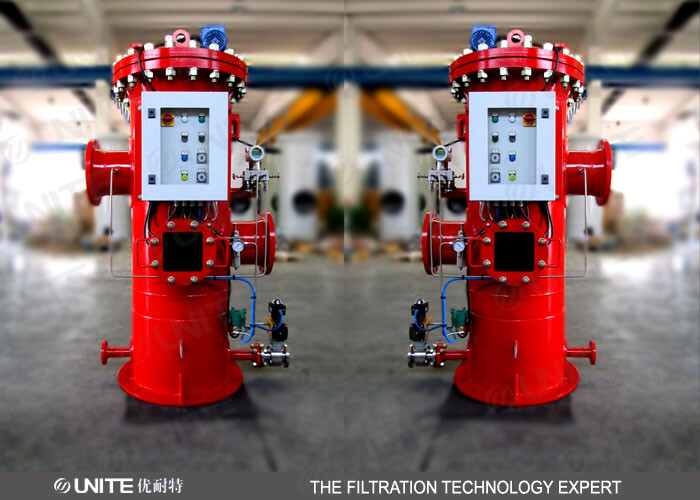 High filtration precision: the filter precision can reach 20 microns, the filter element with various precision is selected. 3. Long service life: normally the working life more than 10 years, and the stainless steel mesh can be easily replaced by different specifications. 4. Large filtering area: the effective filtering area of standard filter screen is 7 ~ 40 times of the inlet area. 5. Reliable cleaning types: there are many kinds of control mode: manual, differential pressure, timing, PLC program logic control and other control mode for choices. 6. Simple and economy installation: diversified structure, suitable for installation in all kinds of site conditions, and does not affect the running effect. 4.Specially made high pressure type filter can be made based on customer's request.